Virginia Gov. 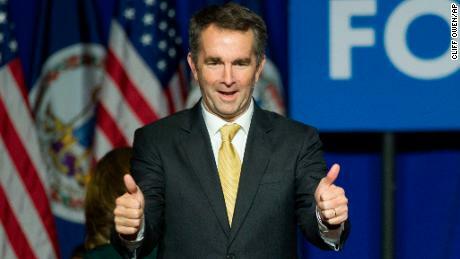 Ralph Northam’s political career is about to be aborted, although presumably the cracker Democrat is being “kept comfortable” in his final moments as the party elders hold “discussions” about the “tragic and difficult circumstances” in which he finds himself. Oh wait, those were the very terms the erstwhile Social Justice Warrior had used only hours earlier to describe the infanticide that his party was enthusiastically proposing to legalize in the Old Dominion. As Northam himself noted as recently as Thursday, in the case of “severe deformities,” sometimes a decision must be made, for the good of all parties, in this case the Democrat party. Talk about severe deformities — politically, in the blink of an eye, Northam had gone from toast of the town (well, Georgetown anyway) to just plain toast. After admitting twice Friday that it was him in the racist photo — and issuing groveling apologies — the “embattled” Democrat whose nickname in college was “Coonman” Saturday suddenly did a 180. Northam now claims that it wasn’t him in the photo, after all, even though he’d acknowledged submitting all the other pictures on the page. And oh by the way, Northam gulped, there was that one other time he actually was in blackface, at a Michael Jackson dance contest in San Antonio in that same year where he, uh, “darkened” his face. Next time, governor, maybe you should go with the cordovan polish instead of black. Most Democrats prefer Kiwi. He has to go. Once again, the DemoKKKrats’ mask — or should I say, their hood — has slipped, and the party of Bull Connor, George Wallace and Ted Kennedy’s pal Fritz Hollings is yet again revealed for what it really is. Only hours earlier Northam was being hailed, from CNN all the way to MSNBC, for his unwavering support of a “woman’s right to choose.” He was a front-runner for a Profiles in Courage award. But now he is exposed as the crudest of racists, posing at the age of 25 in either blackface or full Ku Klux Klan regalia — he has thus far declined to reveal which miscreant he is in his medical-school yearbook photo. Al Jolson or Democrat Sen. Robert Byrd — does it really matter? It is indeed a memorable snapshot, reminding the state legislature’s Black Caucus of what they called “the legacy of slavery, racism and Jim Crow” — in short, the legacy of their own Democratic Party down through the centuries. Heady stuff, coming from a modern-day Theodore Bilbo whose nickname as an undergraduate at Virginia Military Institute was “Coonman,” according to that school’s 1980 yearbook. The ironies just keep piling up. Into the 1960’s, Virginia’s DemoKKKrats led the Solid South in their apartheid ways – they called their pro-segregation agenda “Massive Resistance.” More recently, led by Sen. Tim Kaine and his dirty-hippie Antifa son, Virginia Democrats have labored to be the face of #theResistance. Now, thanks to Gov. Coonman, we know that the difference in Virginia between Massive Resistance and #theResistance is … not massive. Gov. Coonman’s fellow Democrats have been predictably shocked, shocked — not by his hysterical endorsement of infanticide, but by the ancient photograph. Naturally they piled on, because 10-on-1 is Democrat fun. I guess Kamala forgot his name. Sen. Elizabeth Warren found the photo “deeply disturbing” — even more disturbing, apparently, than falsely claiming Native American heritage in order to game the system of racial preferences so revered by the party of Coonman. Sen. Sherrod Brown, once accused by his estranged wife of “physical violence and (an) abusive nature,” likewise demanded Northam’s immediate removal from office for moral turpitude. Ex-NY AG Eric Schneiderman, whose Sri Lankan ex-girlfriend said last year that he referred to her as his “brown slave” and slapped her until she called him “Master,” could not be reached for comment. Neither could those other moral titans of Democracy in the Empire State — Anthony “Carlos Danger” Weiner, locked up in the federal pen in Ayer, and ex-Gov. Elliot “Client No. 9” Spitzer. It took her until almost 10 last night to see the picture? The photo is so damning that not even the most shameless of the alt-left media could mount a credible defense of their hero. Not even the Alibi Ikes of The Washington Post, which after the infanticide debacle in Richmond, ran a fawning puff piece on the female Democrat sponsor in the legislature, including three photos of her with her baby daughter, and at least six references to the fact that she has children of her own. Translation: He’s a redneck. He’s from the same area where in 2016 crooked FBI agent Peter Strzok claimed in texts to his married mistress that he could “smell” the Trump supporters at a local Walmart. But not, presumably, in his traditional blackface or Klan regalia. This is shaping up as a rough day for the DemoKKKrat party. But given the (however tenuous) connections of both Gov. Coonman and Ronald Reagan to VMI, I think I’ve come up with the perfect excuse they can offer on the Sunday morning chattering-skull shows tomorrow. It’s all Ronald Reagan’s fault!